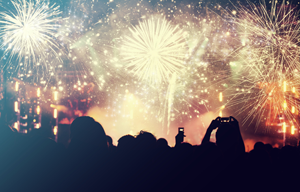 Every July Fourth, nearly half of all Americans will watch a fireworks display or head to a community celebration. That’s a lot of people to be sitting or standing so close to explosives. Even if you aren’t the person lighting up the displays, it’s important to know how to be a safe spectator. You might think you’re not the one with a lighter in your hand, so why not drink a few too many? The more you drink, the more likely you are to become a distraction at the display. With July Fourth as America’s No. 1 beer-drinking holiday, it may come as no surprise that many accidents, whether involving fireworks or crash fatalities, come as the result of alcohol. With too many drinks in your system, whether at a public or private fireworks display, you may be more likely to do something you wouldn’t otherwise. For example, you may try to shine a laser pointer or flashlight into the firework lighter’s eyes. Think that’s never happened before? We didn’t dream up that scenario . It’s happened, and it’s extremely dangerous. Your pets likely have much more sensitive hearing than you do, which means fireworks can be practically deafening to them. When displays start, pets are likely to become frightened, and their initial response may be to bolt. Even if you have them tied, they may become stressed enough to chew through their tether. The chaos of a bolting pet is potentially harmful for your animal, with an increased chance of becoming lost or getting hit by a car. It’s also a distraction to other spectators and the firework lighters. So always, always, always leave your pets at home — and make sure they are indoors before you leave, just in case your neighbor decides to light fireworks while you’re away. At a public fireworks display, make sure your children remain with you. They should not be wandering around the grounds, as they are likely not to notice blocked-off areas like you would, or may be tempted to cross those areas just to see what they can find. Children, much like pets, have more sensitive hearing and may be more likely to become frightened by large fireworks displays as well. If they do, it’s important for parents to take them away from the display and not encourage them to “stick it out.” That will only make them more fearful and more likely to run away. Even for diligent adults, it’s easy for children to wander away while parents are watching the sky for the fireworks. When you arrive at the display, point out a location where your children can meet you, should they lose you. Maybe it’s a telephone pole or a swing set, but it should be something they can find easily in the dark. It should NOT be your car. You do not want your child trying to find your car amid busy streets and other cars exiting parking areas. Rather, the location should be a good distance away from parking areas. At a friend’s home or your own home, similar rules apply: You should keep an eye on your children at all times and they should remain near you. Without any blocked-off areas, they will have no sense of how close they can safely get to the fireworks. They are also likely to not understand how dangerous fireworks (and even sparklers) may be. It’s your duty as a parent to explain to them the dangers of such explosives and why they must remain with you at all times. It sounds like an obvious rule, but again, we wouldn’t be posting it here if it hasn’t happened before. Never set off your own fireworks when someone else is. It’s a distraction to the person lighting the fireworks and also dangerous to other spectators, whether at home or in public. During the July Fourth holiday, nearly 700 Americans will go the ER with fireworks-related injuries. On your own property or in a friend’s backyard, remain out of the way. Never stand in front of or above the firework that is about to be set off. Your best bet is to find a seat near your home or landscaping to watch the fireworks display, which should be set off in an open space several yards away.